Ghanam Ibrahim’s shovel scrapes the concrete as he scoops up debris and tosses it onto a growing pile at the bottom of the canal, ready for removal by an excavator. The 35-year-old father of six is part of a Food and Agriculture Organization of the United Nations (FAO) project that is restoring the water supply to the once fertile Ninewa Plains for the first time since the Islamic State of the Levant (ISIL) took the area in 2014. Through the cash-for-work component of the project, FAO is employing Ghanam, along with more than 500 local labourers, to clean the main canal of the north Al Jazeera irrigation scheme. The work will not only allow farming activities to get back underway, but is providing much-needed income for families (around 3 000 people) through money from daily wages. The Al Jazeera irrigation scheme once supplied 250,000 hectares of land with water for agriculture, livestock and domestic use. The main canal fed a network of smaller canals, 100 of which were damaged by ISIL, filled with debris and contaminated by explosive devices. Bridges were also blown up and the damaged pumping station, which provides water to the canals from Mosul Dam, is working under capacity and has caused extreme water shortages. “This area was once known as the breadbasket of Iraq,” said Dr Fadel El-Zubi, FAO Representative in Iraq. “Farms here provided vegetables, wheat and barley for millions of Iraqis, and well-paid work for people from all over the country. “Families are still struggling with limited access to income and food. Restoring this irrigation system and pumping water back into the fields is critical so that food production in this area can commence again,” he said. As well as providing immediate employment opportunities and income, the project has other far reaching impacts. 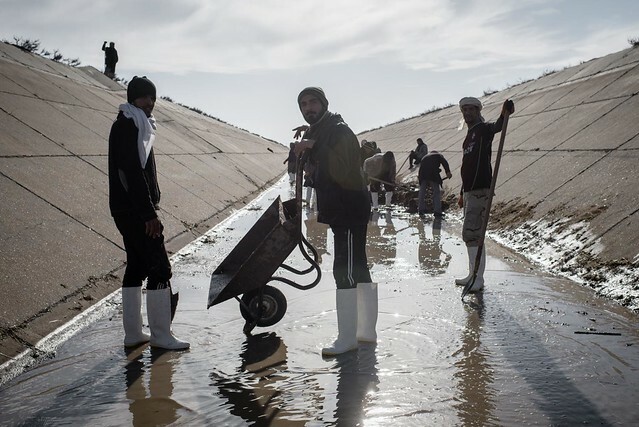 FAO’s implementing partner, the Mines Advisory Group (MAG), is clearing the canal, and the agricultural land either side, of explosive devices left behind by ISIL. This means FAO’s cash-for-work participants can clear the canal of debris, farmers can plant crops and graze livestock safely, and bridges and water control gates can be repaired. FAO has also repaired the pumping station that feeds the canal system, and is replacing destroyed bridges and damaged gates, which divert water down a network of smaller canals so farmers across the area benefit. Once the water supply for agriculture is restored, 5 000 farmers in the immediate area will be able to finish planting and harvesting their winter wheat crop and start growing and selling vegetables again, which also provides six-months’ work each year for up to 200 000 casual farm labourers. As more areas are retaken from ISIL, a major effort is needed in order to rehabilitate critical infrastructure so that agricultural production can resume and livelihoods can be restored. FAO is seeking urgent funding of USD89 million to strengthen its emergency response, including rehabilitating damaged agricultural infrastructure, supporting farmers to vaccinate and feed their livestock, and expanding cash-for-work and other income-generating activities. FAO’s work supports families returning to areas retaken from ISIL, internally displaced families, host communities and refugees from Syria.